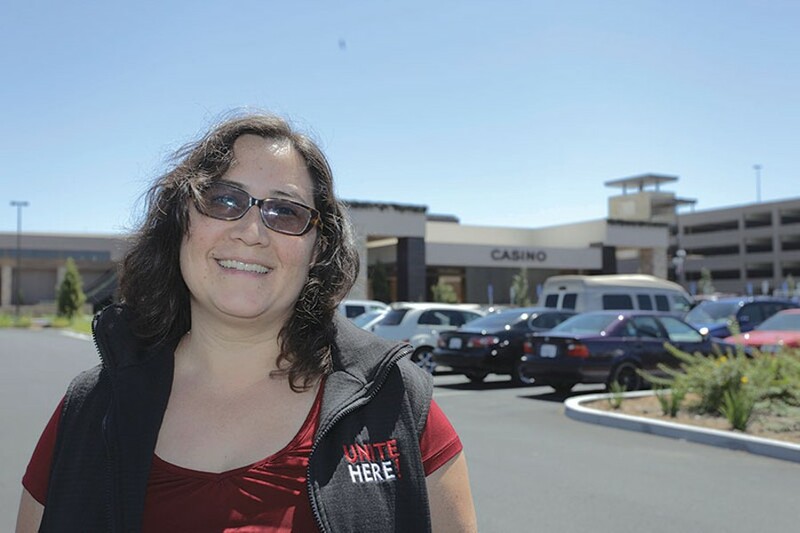 UNION YES Local UNITE HERE president Wei-Ling Huber hopes unionization of the Graton Casino will lead to collaboration with the casino's Las Vegas–based operator. The vote to unionize workers at the Graton Resort & Casino was certified last week. Now 600 service workers and the UNITE HERE union will negotiate a contract—but with whom? "I can't discuss that, and I don't know yet," says Graton Rancheria tribal leader Greg Sarris, who spearheaded the casino deal. Sarris worked with UNITE HERE Local 2850 to organize the union election at Graton Casino in June. The vote was held in the casino in a common room rented to UNITE HERE. The casino is owned by the tribe but operated by Las Vegas–based Station Casinos. None of its 18 Vegas-area casinos is a union shop. UNITE HERE, which represents hospitality and other service workers around the country, lauded the union-friendly efforts of the Graton Rancheria, which allowed the vote to go forward free from "interference from the employer," according to a statement from the union. "We fully respect and support the tribe's neutrality agreement with the union," says Station Casinos spokeswoman Lori Nelson in an email. The pro-union vote is great news for cooks and custodians at the Rohnert Park casino—a contract likely means greater job stability and expanded health benefits—but it's also good public relations for Station Casinos. "I don't know if you've done your research," says Sarris, "but Station is not particularly union-friendly." Casino owners on Station's home turf are at a natural advantage because of Nevada's union-restrictive right-to-work laws. Right-to-work laws, for example, allow non-union workers to avoid paying union dues but still enjoy the benefits of union membership. Culinary workers at Station Casinos in Las Vegas filed charges with the National Labor Relations Board against the company in 2010, claiming it had harassed pro-union workers with surveillance and interrogations of employees interested in unionizing, according to court documents. Company officials have long charged that if anyone was being harassed at the 18 non-union casinos owned by Station, it was the workers, who didn't want to be in a union. "Station Casinos is pro-employee, not anti-union," says Nelson. But a 2012 finding from the NLRB (which followed a ruling from administrative law judge Geoffrey Carter) ruled that Station had violated 82 federal labor laws in trying to keep UNITE HERE out of its Vegas casinos. UNITE HERE local president Wei-Ling Huber says the bargaining process will likely turn on worker issues, with negotiations over wages and benefits probably falling to tribal leaders. Station Casinos would bargain with the union over job descriptions and duties, performance standards and other operational issues, she says. That's news to Station Casinos. The company doesn't plan to be present at the negotiating table, "as this is an agreement between the union and the tribe," says Nelson. The union vote came as the Graton Casino emerged as a post-recession success story for Station Casinos, whose majority-share owners are brothers Lorenzo and Frank Fertitta. Station posted solid earnings in March, according to a statement from the company. The grand opening of Graton Casino in November 2013 was a highlight, the company says, and the company paid off $50 million in long-term debt. In the fourth quarter of 2013, the company received an $8.2 million development fee and $6.5 million in management fees from revenues generated at the new casino. That's a nifty turnabout from the brothers' fortunes at the time of the 2007 economic crash, which hit the gaming industry hard. Nevada was among the worst in home foreclosure rates nationwide. While Station casinos remained open, the company struggled with the fallout from a 2007 partnership with private-equity giant Colony Capital. In that deal, Colony and the brothers took the company private in a $5.7 billion leveraged buyout. Colony partially financed the buyout via an equity fund it created with revenue from casino properties under its control, including Station. That fund was called Colony VIII, according to the Colony website. But the deal was bad news for casino workers, as the Station-Colony deal crashed along with the economy, just months after it was signed. Station eventually filed for Chapter 11 bankruptcy in 2009. The company emerged from bankruptcy intact in 2011. UNITE HERE organizers in Las Vegas claimed that the combination of the recession and the buyout cost more than 2,000 jobs at Station Casinos. The company forcefully disputes the allegation. And despite the company's insistence that contract negotiations in Rohnert Park will be between the tribe and the union, UNITE HERE's Huber sees an opportunity to build a bridge with the corporate operators. "We'll be at the table working on issues together and collaborating on a contract," says Huber. "Hopefully, we'll have some insights into how to bridge some of the differences in Las Vegas."